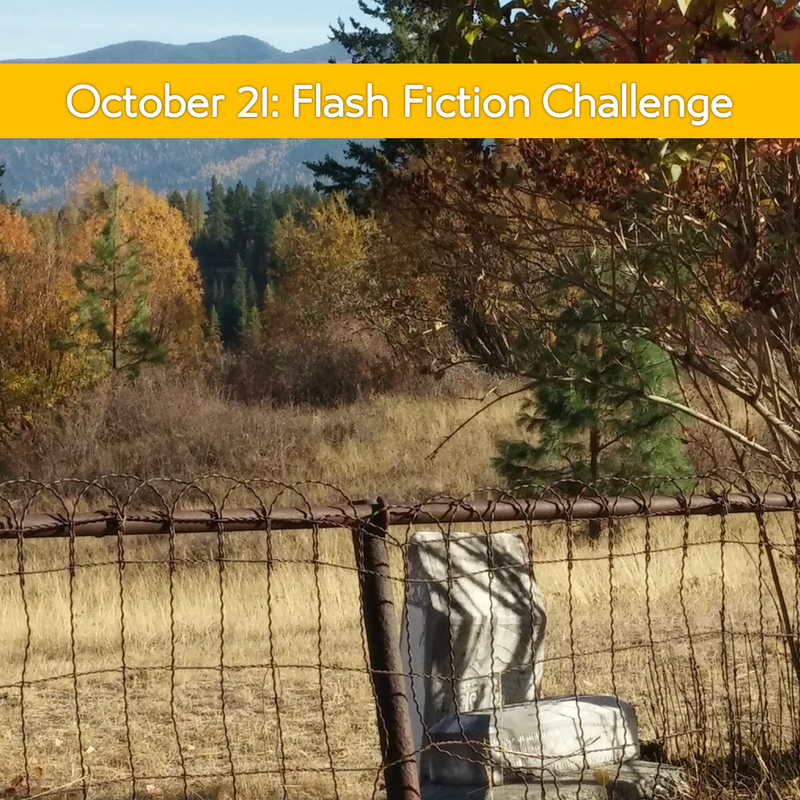 By Charli Mills in Flash Fiction Challenge on October 22, 2015 . Happy editing to you! Thanks for taking time out to read! Haha…so that’s what ‘skidding a log’ means! Great to see – and hear – you both having so much fun out there in those woods Charli 🙂 Love your dogs, so sweet and so well behaved ❤ It really is fascinating all you discovered from your visit to Fairbury Cemetery, I remember reading about it and your 'spooky' photos! The backstory – Lizzie, Clingman, Cobb's first and second burials – makes for a terrific historical fiction novel – yours! – and I look forward each week to reading more of this intriguing story which you tell so darn well. I love how you embellish such interesting parcels of fact with your vivid flash fiction. And as for your prompt, perfect for the Halloween season and, well, I know just the place 😉 See you soon! Skidding is a logging term for dragging a log through the forest! They once used mules or draft horses to skid and now they have actual tractors called skidders. We use our truck like a mule. We skidded a 67 foot log today! And the dogs have two gears — resting and running. They were resting. 🙂 I’m glad you can see why I’m so taken with Cobb’s story. It’s so rich in human complexity. Oh, I’m drooling over what splendidly old cemeteries you must have nearby! Such history! Charli, you ‘re having too much fun with that skidding, but man, it looks beautiful up there! Great flash per usual, the last line made me chuckle! Anyway, here’s mine. I close my eyes and breathe. A musky scent of autumn and prestige. Swirling history that surrounds the great house on the little mountain. The neoclassical architecture, the great columns and breathtaking views. The mysteries under Mulberry row. Intellectual. Architect. Governor. Master. His marker is a little ways down, past the gardens. A lineal descent to the obelisk that marks my sixth great grandfather. No mention of his presidency. Only his famous declaration. Religious freedoms. His university. A woodpecker rattles overhead. Otherwise it’s just us, alone among the falling leaves. The whispers of pride and shame and shared DNA. It is so beautiful, especially with all the golden larch and aspen among the pines. I had more fun, today! We skidded a 67 foot log. It was spectacular when it crested the road. I posted it on FB. Oh, wow, that last line! The way you write this flash it feels almost lulling, the rhythm. The woodpecker breaks that and sets us up for that last one. Beautiful flash Pete. I felt myself there walking through time and history with you, through that gorgeous autumn landscape. And I am very intrigued by your connection! I’ll be thinking about this one for a long time. Thanks guys, and just to clear up any confusion, I wrote this as a Sally Hemming s descendant. I’m in no way related to TJ! Lovely Pete. That entire last paragraph is very moving. The feelings and connection are palpable. This was so beautifully done, Pete. Thanks guys for reading, it’s a beautiful place, a national treasure for sure! A double dog dare? Not had one of those before. That’s a challenge can’t refuse! Lovely piece of flash Charli and I hope you enjoy your jolly. Tomorrow is jolly day! You and Sherri have access to amazing plots of history. I still think of your post on New Forest and the pottery shards, too. Hahaha! 🙂 I even put ‘Double-Dog Dare’ in the title of my post! I felt like a time traveler, travelling back in time to 1853. 😀 Any writer caught lurking in a cemetery this week can just say it was a double-dog-dare! Great that you used it in the title! I love love love this topic. Graveyards have always appealed to me. Just visited a large leafy city one in Waterbury Connecticut last month, and last year in North Dakota had a splendid time searching out a forgotten and neglected graveyard out on the prairie that my cousin had remembered coming across. Now they march in my mind: Highgate Cemetery in London, revolutionary graveyards in Boston churchyards; the curiously crowded, grass-less spaces in the corners of Japanese cities with their stone markers and monuments. I also found your short history of home burials fascinating. My hub hates to talk about such things, but for me, that is how I would love to rest, by becoming a meadow (as an ad for natural burials once put it). As for mattresses and pillows, that should be a prompt of its own 🙂 Back later with more thoughts on your flash, and one of my own. Oh, I was following your march of cemeteries like a list of good books to read! It makes history somehow more tangible when you connect to people and graves call us to remember them. Some people get really freaked out by graveyards. And I like your idea for a prompt! That could be most interesting! I’d love an eco burial and be part of a meadow! A great story! I’m assuming those two logs are now in your firewood pile for the winter? And you left us with a Double Dog Dare! I love the internet. It turns out that in Victoria BC, they have walking tours of old cemeteries every Sunday, except in January. In October they have Ghost Walks. It just might be a fun thing to do. Yes they are! We will be warm and cozy this winter. I love ghost walks! They do one over in Bannok, Montana and basically all the ghosts (costumed volunteers) condemn or question the sheriff who was hung in the 1860s. How fun that Victoria, BC is doing that! Thanks for the lesson on log skidding, an entirely new one on me. And I hope you have a great day at the cemetery. Terrific post and flash, Anne! What a journey you’ve had in a short time, yet the writing process itself is so much longer. May it all continue to grow and develop! I agree. We all know we’re going there, why rush things? The log skidding is a lot of fun, and we can combine it out west. But alas, I understand Ed’s (and your) point of view! An icon speaking from beyond his restful slumber. See, I need more lines like that! You call him racist, yet you never met the man. You call him slaver, not taking into account the times. You try to see a past world through the rose-colored glasses of the 21st century- instead of walking a mile in the shoes of the men and women in our household. I hold you to account. Yet you fail to grant us the respect you claim he lacked. You leave our graves unmarked. To you… we are a tourist attraction? Left a comment on your blog. have to say here that this was a powerful piece and very thought-provoking. Feel like this is in repsonse to my flash and if so, where do you feel the Hemming’s fit in? Do you think they belong at the table during reunion dinners? I was just thinking of your two flashes as companion pieces. Have you seen Finding Your Roots on PBS? I like it because it explores the complexities of ancestry in the US and isn’t intimidated to openly discuss slave history from both sides of the family tree. Like your flash: pride and shame, except it’s not so clearly assigned and too simple to draw lines. Ah, one would hope that we study the lives(and graves) of the past to foster understanding. This one really makes me stop and think about the judgements with issue backwards. I’ll have to check that out, Charli. Being just down the road from Monticello, these two flashes hit close to home for me. I have always been fascinated with the enigma that is Jefferson. And that’s what’s nice about Monticello, they openly discuss Thomas Jefferson and instead of sweeping it under the rug, they welcome the discussion of slavery. Here’s a quote from the man himself on the topic. He was quite conflicted, and unlike Washington decided not to free his slaves upon death. But I do like that the Hemmings are now fully recognized as true Jefferson descendants, as for years they were not. With all that being said, I really enjoyed Roger’s flash, and in reference to these places being tourist attractions, I say, better history than Disneyland! Wow, what a treasure to live so close to! I know about the place mostly for the heritage seeds that they preserve. There’s such a peace in being able to discuss history without that lens of judgement. Glad to know they do that, and Jefferson, like many thinking men at the time — and women, too, I’m sure — must have felt conflicted yet caught up in the times. Thanks for sharing! Charli what a wonderful journey you took us on today. From resting in beds designed for two to skipping logs (loved the pooches in the car) back to the cemeteries in your surrounding area and back in time to Mary’s resting place. I loved the last line of the flash – it made Cobb come back to life. I am also starting to imagine your life in winter looking at the terrain and the number of trees you are preparing to get you through the winter months. I love looking at old cemeteries and imagining the stories behind the short lives, and young lives lost. You will have a great novel come from your cemetery trips. Great post and flash Irene, and interesting how you dealt with what is becoming a more and more pressing question in people’s minds, that of our burial arrangements. Like Stanley in your flash, I would find great comfort in having it all arranged. Lovely how you made the connection between his life’s work and his decision for burial. Thanks Jeanne. The two went hand in hand. If they make a mistake he feels that he has more experience of digging than he does of escaping flames. Thanks, Irene! Cobb was restless in life and still he roamed after death. 🙂 We continue to fall trees and now have to light a fire in the mornings and evenings. Those mountains will fill up with snow and spill out onto our valley floor. I hope to collect many stories and have the output to match! Great post on mortal remains! Thanks Charli. I feel cold just thinking of you in a valley and the snow coming down. Brrrr…. The Lone Butte Pioneer Cemetery is the final resting place of homesteaders, ranchers, loggers and town folk. The cemetery is located at the western base of a tall volcanic plug that known by the locals as the Butte Rock. Touching flash. Evocative setting. And the end makes a reader ponder time and memory. Dear ones who have died will stay alive as long as there are generations who remember them. All we need to do is write down their story and make sure someone else reads it. Just that description of the cemetery is evocative — men and women who came to live in the shadow of a tall volcanic plug. Great line that shows how the connection is still there yet fading: “a rain rutted road that takes it leave from the well travelled route below.” I’d make a Cemetery Day of it with you and have you tell me the stories I suspect you already know! Ha! I’m not going to take your double dare, and I’m not going to scout around the gravestones in a cemetery day! But I will join in your challenge … later. I really enjoyed your videos and loved hearing your laughter and delight at skidding the big one! Your analogy of mattress and the ‘right fit’ is fitting. I’m pleased you are going to get your cemetery day. As if a grand view is necessary for a cemetery. Sorry. I’m showing my cynicism. I hope Hub gets to the mountains viewed to collect firewood one day. The information you found out about the burials of Mary, Clingman (really? It sounds like a superhero plastic wrap) and the cousin is fascinating. It will be interesting to find out what you come up with in further explorations. Your flash is good too. Sarah’s resignation to the situation is probably exactly what a stoic woman such as you have portrayed would feel. Well done. Aaah! We were doing our cemetery tours on the same day! I went on Friday! I don’t know why I’m using so many exclamation points! I just think that’s so cool. 🙂 Also, the videos are awesome. I had no idea what you were talking about but now I do and have a visual to go with it. 😀 Fantastic flash. Jean had loved studying World War I since her teens. Now 49. Finally in Ypres. Sundown, facing Menin Gate with the rest of the crowd. She had walked through the marble arch, glazed over at the names – over 54,000 soldiers whose final resting place was not known, men who had died in battles of Ypres. Futile, Jean thought. Those poor men – they didn’t pick the battles or the cause. I had a similar feeling Paula when visiting Dieppe many years ago. It’s where the Canadians came ashore on D Day. Had such a strong feeling of the presence of all those men who died before their time. Just visited the cemetery where my husbands parents are buried. His uncle is there too, after whom my husband is named. He died at twenty. Their deaths were not futile, given that struggle, but yes, they seem a dreadful waste on a personal level. Beautiful flash. Thanks, Jeanne. Different war, different cause. “Jean” would never say that the Allies’ deaths in World War II were futile. That must have been a powerful experience. Great flash, Paula! Remembering is very important. A very moving piece, Paula. old house in the neighborhood is over two hundred years old. The map could be from the 1800’s or the mid-late 1700’s. surrounded by a black wrought iron fence and is well kept. Update: I can only hope that they were moved respectfully. As the other week I drove by and the cemetery in this story was…gone. The pioneer cemetery in Helena, MT was removed and a school built on the field. There’s a story, perhaps myth, that in a 1950s flash flood the coffin of a miner was exposed. It makes me wonder if anyone can ever accurately remove an old cemetery because many graves become unmarked over time. What a touching gesture, to buy flowers for the forgotten that the city was built upon. There is a Jewish tradition of leaving stones on top of a grave stone or marker to let the deceased know you visited. I didn’t know about the military leaving coins. Oh, Jules! I just love the curiosity of writers and sharing what we learn. I did not know that about the Jewish tradition. Out west, and I’m not sure where it originated, but there are ancient cairns of indigenous peoples and even the cowboys would add a rock to the “ancestors”. How sad Jules but that is the mark of time I guess. One can imagine the shifting world around that little plot. And wonder where the ghosts have gone. What a lovely gesture you performed there. I hope the bones are resting somewhere more beautiful. Your story was spooky though errr!! I wanted to write something spooky, or at least seriously scary! But my subconsciou took over and came up with a very cheeky biblical story 🙂 Eve causes havoc yet again! Even those who had the wealth to be remembered as they wanted fail in that endeavor. I guess it is the ultimate in letting go (of control). 🙂 Funny how our brains work — from scary intentions come cheeky stories. This group has forever scarred me in regards to unicorns and wheelbarrows. It works the opposite, too! Hope you are having a splendid book signing today! Thank you, Charli💖📚✒ Yes it went well. I’ll be posting about it next Wednesday on IWSG! Good to hear! I’ll tune in next Wednesday! Fair enough! My interest in gravestones is, after all, about history. That’s an interesting situation to put Marnie in and I’m curious to find out how she reacts. Ha, ha! You even brought a dog to the double-dog dare! Ha, ha! Your apparition has appeared! I’m off to discover what Ethel has done with the white nighty! Skids in under the wire…gets tangled in the wire…rips out handfuls of hair trying to disentagle myself from the wire…gives up, decides the wire is a new fashion statement.